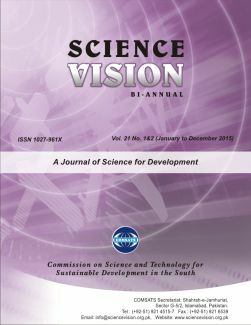 Science Vision is a bi-annual peer-reviewed journal published by the Commission on Science and Technology for Sustainable Development in the South (COMSATS). As an inter-governmental organization dedicated to the sustainable socio-economic uplift of its Member States, COMSATS has been publishing this journal since 1995 for scientific information dissemination in a broad range of fields, such as agriculture, renewable energy, environment, health, education, ICTs and water resources. The journal focuses on the socio-economic development especially with regard to the developing countries. Research as well as review articles are invited having general scientific descriptions on a specific topic; comprehensive discussion of the impact of relevant discoveries and innovations on the society for creating understanding of the contemporary issues and challenges; as well as practicable solutions to the problems. The elucidation of relevant technical details for the benefit of non-specialists are expected to be a part of such papers. Who Should Write for Science Vision? Scientists, researchers, policy-makers and young scholars from S&T organizations as well as freelance experts with relevant interests and study are invited to write for the journal in line with its focus – impact of S&T on socio-economic development. In order to ensure the quality of the articles published in the journal, the submitted manuscripts are first vetted to see their alignment with the scope of the journal and sent for refereeing. The International Editorial Advisory Committee also facilitates the refereeing process. The Editorial Board retains the right to accept or reject the submitted papers and suggest revisions based on confidential report referee report(s). Necessary editorial corrections may be carried out before the galleys are finally sent to the authors for final review before publishing. Papers should be typewritten on A4 paper (210x297 mm), with double spacing and 3 cm margins. Each section should begin on a new page and may include: title page, 150 words abstract/summary, keywords, text, illustrations, tables, and references/bibliography. The title page should contain: (i) the title of the article; (ii) names and initials of each author with their highest academic qualifications; (iii) name and affiliation of all the authors; (iv) the department or institution to which the work should be attributed (if necessary); and (v) name and address of the author responsible for correspondence along with his/her email address. Tables and illustrations with captions/legends should be carefully numbered, cross cited in the text and should have the source duly mentioned. Harvard style (e.g. Bond,2004) should be used for in-text citations and end-notes (References and Bibliography). However, any other popular style of referencing may be used, provided that it is used consistently throughout the paper.